Franciscan Sister Giovantonia ladling the batter. “The Body of Christ” is a phrase Roman Catholics are familiar with when receiving Holy Communion. We do not question the host’s provenance but accept it for what it is after the transubstantiation. Communion hosts do not ‘just happen’, they are produced by someone, somewhere. And that ‘someone’ has traditionally been nuns as part of their ora et labora (pray and work) ethic. Nowadays, only two convents manufacture hosts in Malta – the Missionary Sisters of Jesus of Nazareth at their Żejtun mother house and the Franciscan Sisters of the Heart of Jesus at their convent in Msida. The Missionary Sisters have been producing hosts – from the Latin hostia, meaning sacrificial victim – for some 70 years, while the Franciscans have been at it since the early 1970s. The mixture is then ladled, a spoonful at a time, on to what looks like a waffle maker. The lid is engraved with crosses or the Christogram IHS. The griddle is closed and the mixture bakes for no more than two minutes. The result is a cream-coloured, wafer-thin – literally – sheet. 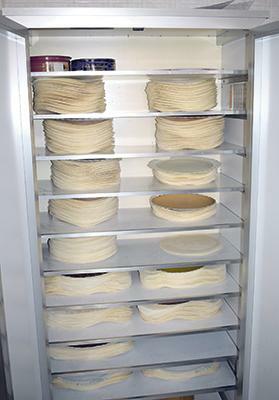 These are then stacked and placed on shelves in a cupboard for drying. This process may take from one day to a week, after which the sheets are placed in a cutting machine and punched into individual disks of 3.1cm diameter each – the finished communion wafers. These machines can cut up to 42 hosts at a time; others punch larger, single hosts measuring 7.5cm each that are used by priests when celebrating Mass. Before packing and consigning, the hosts are checked for flaws and ‘dents’. Damaged hosts, like the offcuts from the sheets, are bagged and sold to shops for children (and adults) to enjoy. Hosts that ‘make the grade’ are placed into plastic boxes and sold to parishes by weight. Each weighs about 0.25gms, that’s some 4,000 communion hosts per kilo. Read: How can the Church boost interest in its message? Amounts bought depend on a parish’s size; for instance, Manikata buys 300gms of hosts a month, Rabat acquires 4kgs and Attard parish buys 5kgs. Institutions such as St Vincent de Paule Residence order 4kgs a month. And the cost? Each convent has its own pricing structure that varies from €23.29 to €27.95 a kilo. This age-old industry, a cottage one at best, is now facing competition. Firstly, neither convent has a daily production line; the Missionary Sisters bake hosts on two days a week and employ two lay helpers. In Msida, two Franciscan nuns produce their communion bread three days a week, sometimes four. Dwindling church attendance is one contributing factor to the drop in demand for convent-produced hosts. The other is that many parishes are now buying foreign-made hosts. And the major importer is the religious shop Emmaus, run by the Conventual Franciscans at their Centru Animazzjoni u Komunikazzjoni in Birkirkara. Although they import from various sources, the Italian manufacturer Ostificio Domus appears to be Emmaus’s principal supplier. Available from the Birkirkara outlet are packs of 500 hosts, measuring 3.5cm each at €2.40 – that’s €19.20 for a kilo, considerably cheaper than convent produced communion bread. Tins of 3,000 are price-tagged at €19. Emmaus also sell gluten-free hosts – something the nuns do not produce – and say the demand is growing. Packs of 25, 3.5cm hosts retail at €2.40 and are also available in containers of 50 at €4.50. It is not only the Roman Catholic church that buys sacramental bread, many other Christian denominations also partake of communion and acquire their hosts locally. Because their communities are so much smaller, quantities are miniscule in comparison. For example, St Paul’s Pro-Cathedral in Valletta use about 200 hosts a week, bought from a religious goods shop in the capital. Although other denominations help keep the ‘hosts business’ alive, we are unlikely to see a reversal of fortunes for the convents that produce the communion bread.